Perfect for people who have a boat - our docking facility is located on the point and is 25 feet deep with absolutely no weeds, complete with a dock ladder for swimming conveniences. Picture perfect panoramic views of the lake and manicured landscape to boot. We are the only cottage where if you have 4x4 vehicle you can drive right to your dock bring your cooler have a picnic and just relax. This contemporary cozy cottage rents from one night to multiple days. Gas fireplace, hardwood floors, stainless steel appliances, wine fridge, Italian leather couch, sleigh bed, AC and French doors that bring the outside in. We have a professional cleaning service so cottage is clean and tidy with prepared beds. We offer an extended checkout time to all of our guests. You arrive at 4pm and can stay until 4pm on your checkout day to enjoy the beautiful docks and more relaxation time which could include tanning, enjoying water sports or hitting the trails on your very own snowmobile. The cottage is 2.5 miles from the main highway on a gravel cottage road surrounded by lush woodlands. The cottage is unique inside and out with manicured landscape, indoor and outdoor fireplaces, plush kitchens, AC and outdoor hot tub. Perfect for honeymoons, hikers or power sport enthusiasts that want to go boating, ATVing and snowmobiling! Go hiking from from the cottage door on 30,000 ha of crown land! Hit our Haliburton ATV and Snowmobile trails right from the cottages on OFSC Trail B103 and #9. Go around our lake with ten thousand acres of crown land surrounding our beautiful cottages. If you have toys and want to enjoy them then this is the perfect place to stay in Haliburton or Muskoka. Only a 15 minute car, ATV or snowmobile drive to the village. You can make your getaway even better with a minimum 2 day Jet Ski, ATV or Snowmobile - ask us for more! Or Bring your own Jet Ski, ATV or Snowmobile. You have access to 1,700 km of ATV & Snowmobile trails right from our doorstep! Our adult only cottage rentals are on the OFSC Snowmobile and ATV trails that lead you through Haliburton Muskoka, Bancroft, Parry Sound, Whitney and Peterborough. Both cottages are 2.5 miles from the main highway on a gravel cottage road surrounded by lush woodlands. Each cottage is unique inside and out with manicured landscape, indoor and outdoor fireplaces, plush kitchens, AC and outdoor hot tubs. Perfect for honeymoons or power sport enthusiasts that want to go boating, ATVing and snowmobiling! Hit our Haliburton ATV and Snowmobile trails right from the cottages on OFSC Trail B103 and #9. Go around our lake with ten thousand acres of crown land surrounding our beautiful cottages. If you have toys and want to enjoy them then this is the perfect place to stay in Haliburton or Muskoka. Only a 15 minute car, ATV or snowmobile drive to the village. Notes: The cottage must be left as you find it. Absolutely no smoking inside the cottage. Renters must clean the cottage before they leave. We supply fresh linen and the beds are pre-made (by a professional cleaning company). In the winter months, the cottage can only be accessed by 4 wheel drive or all wheel drive vehicle. If you do not have one, we offer a shuttle on check-in between 4pm-6:30pm and a shuttle on check-out at 11am. Looking for Adventure? You can make your getaway even better with a minimum 2 day Jet Ski, ATV or Snowmobile - ask us for more! Or Bring your own Jet Ski, ATV or Snowmobile. You have access to 1,700 km of ATV & Snowmobile trails right from our doorstep! Our adult only cottage rentals are on the OFSC Snowmobile and ATV trails that lead you through Haliburton Muskoka, Bancroft, Parry Sound, Whitney and Peterborough. Haliburton Village is 15 minutes, Beer Store, LCBO, Gas Station 2 Grocery Stores, laundry mat, library, Bait & Tackle, Restaurants. High end Surround sound system with Cerwin-Vaga Speakers, 2 NAD/Caver Amps and NAD Receiver. Android TV Box, unlimited movies, tv and sports. Box office movies. Deck over looking lake, panoramic view of lake 80’ high with large 14’ mushroom umbrella. Table seating for 4. Large Dock 16x20 with tie-up for boat. Rent ATV, Snowmobile or Jet Ski. On-site delivery. Make this a romanitc adventure getaway for 2. Book this accommodation and request onsite rentals. We can provide onsite Jet Ski, ATV or Snowmobile rentals for an additional cost. This spot is the perfect get-a-way for two. The loft is cozy, quiet and intimate. Linens, towels, kitchen fixings (cutlery, pots/pans, even popular ingredients) are all provided. The view from the deck is beautiful. 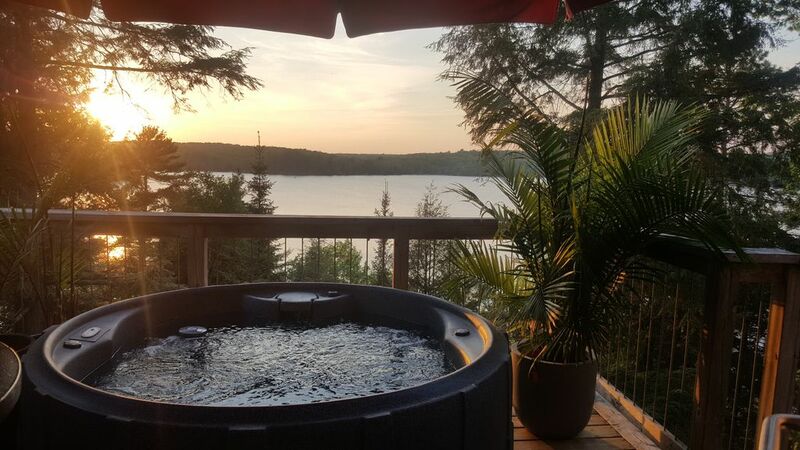 Hop into the hot tub and listen to the wind whispering to the pines. Haliburton Village is a 15 minute drive. A year round haven for outdoor enthusiasts. Leave your city routine far behind and embrace the silence. The loft was better than advertised. The lake view is amazing from the deck hot tub, but even better from the private dock a short walk down the hill. There were four fire pits for use, including right next to the loft and on the private dock. The living quarters were fully equipped and well-maintained with fireplace, high-end entertainment system, and large televisions in the living area and bedroom. All kitchen amenities were provided for cooking our own meals, including the grill on the deck. The town of Haliburton is a short 20 minute drive and has everything you'd need, including restaurants and shops. Algonquin Provincial Park is approximately 1 hour 15 minutes, and is a must see (the primary reason we came was for its hiking trails). The drive to Algonquin itself is beautiful. We had no problem with cell or GPS service getting to the loft and at the loft. We'll certainly be back during summer when we can take full advantage of the lake. The two cabins on the property are situated so that we never heard our neighbors and only saw them when leaving the property. Our deposit was also returned the following day without question. Thank you Dudley and Kim. (Couple in their early 30s from Cleveland on a weekend getaway from the city). Great place to unwind and have all the luxuries! It is very secluded, clean and you have everything you need! 2 hr ATV tour was awesome! I also want to add that the place was very clean and considering how far into the woods we were, there were hardly any bugs. This would have done it in for me, so I can honestly say whatever they did to keep them away really worked. There was some wildlife, but this was a good thing for us. They did a great job making it feel really luxurious. We were very happy. Beautiful loft. Looks just like the pictures. Enjoyed the hot tub and canoeing (there is a canoe available for you to use for free) on the lake. Couple of things note: 1) the owner is not around so any questions you have are answered via text 2) you must take your garbage off the property and dispose of it yourself. Great spot with all the amenities of home! The road to the waterfront is a bit challenging. Owner should consider building a stairway as the neighbors have! I wiped out walking down and luckily fell on my big 'asset'! No working smoke alarm! That should be corrected right away!! Rent an ATV, Snowmobile or Jet Ski through us and it will be onsite for your use during your stay. Please let us know if you would like an onsite adventure rental. The cottage must be left as you find it. Absolutely no smoking inside the cottage. Renters must clean the cottage before they leave. We supply fresh linen.